Sync your Rdio, Spotify, and Twitter accounts to explore, discover, follow, play, and tweet music with the Twitter #music iPhone, iPod Touch, and iPad app. The incorporation of two modes of navigation and simple gestures complements the spontaneity, serendipity, and excitement of listening to music in a fresh, fun way. The interface of the Twitter #music iPhone app seems to revolve around the idea that there should be two ways for everything–except how you tweet what currently plays via #nowplaying and how you sync your Twitter account. There are two ways to sign in to your Spotify or Rdio account. At the end of the brief introduction contained in three or four slides accessed by horizontal swipes, you can sign in to them. Or, when the Twitter #music iPhone app opens to its home screen, you can tap the top middle icon to open a menu that slides down. The menu has Spotify or Rdio at the top of the list, followed by emerging, suggested, #nowplaying, and me. You touch the me icon, and you sync your Twitter account in a couple of touches on the screen. Your profile page appears with your Twitter details, and the musicians you currently follow arranged in a matrix. The popular, emerging, suggested, and #nowplaying feeds have the same layout. Each musician’s photo is accompanied with their name, and the layout is in a matrix. You use a vertical swipe to explore the list. You can continue to move between the categories with the use of the drop down menu from the top bar. Or, you can swipe horizontally to switch feeds. You touch an artist’s photo, and it expands in size. When a photo is highlighted, the other artists’ photos form a photo collage around it. You touch the middle of the photo to start playing an artist’s song, and you can highlight the Twitter symbol to follow the artist. The artist’s Twitter handle is listed just below the highlighted photo, so you can touch the Twitter handle to find a list of musicians the artist follows. This is a cool way of finding new music. When you play a song, Spotify and Rdio users will listen to it through that service. If you do not sync those accounts, a preview of an artist’s song with iTunes is played. In the lower left hand corner of the screen, you will find the play button. You can touch the play button, and it expands on the screen. The name of the artist and song frame the play button. There is a small photo of the band, and, with a touch, you can move to the artist’s profile. In the upper right hand corner of the play button is the compose tweet icon. 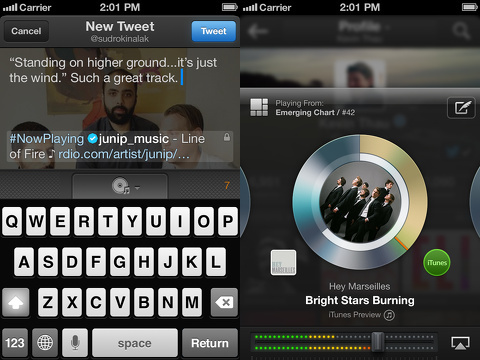 With a touch on it, your tweet is automatically crafted and acknowledges the artist and source of the music. You can also add details. I do wish you could tweet #nowplaying from the feed interface as well. There is enough space to incorporate that icon without cluttering the interface. 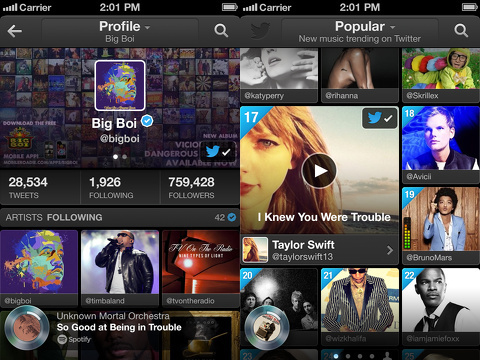 The excitement and attraction of the Twitter #music iPhone app is the chance to funnel and filter musicians and bands. The suggested feed had a couple of fun suggestions, as well as a few I would expect based on my Twitter social network. The #nowplaying feed is a cool way to discover artists played by your Twitter followers and those you follow. And, for me, it helps me keep up to date with popular music, so I can talk with my friends’ kids. I just learned of the band One Direction yesterday. Some people may be frustrated by your lack of ability to select a specific song, but this is a tool for expanding your musical horizon–not limiting it. The Twitter #music iPhone app is well-designed, easily navigated, and a pleasure for music lovers–especially those with Spotify and Rdio. AppSafari review of Twitter #music was written by Jenni Ward on April 18th, 2013 and categorized under App Store, Free, Music, Social. Page viewed 3881 times, 2 so far today. Need help on using these apps? Please read the Help Page.